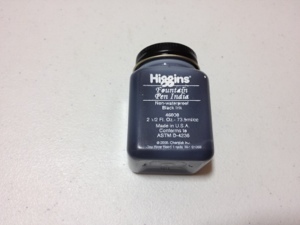 Higgins non-waterproof fountain pen India ink. I don’t really have more of an introduction than that. This’ll be pretty short because there isn’t much to say about ink. But there is still enough that it is warranted. First off this ink is black, I mean really black, even when it is diluted by water it is still a solid grey, it doesn’t turn into a deep green or blue. It is not true India ink because it does wash off with water, but you’ll have to do some scrubbing. It is fairly thin because it is used for fountain pens, making it less suitable for most other uses. Applied over a large area it causes the paper to wrinkle, but not too severely. But because of this it is very smooth, and any line problems will stem from the pen. It shows through most papers and stains a lot of items. So one must be careful while using it. Over all the ink is nice, it works well for fountain pens and is okay for other tasks. It is water soluble so it can be cleaned up (if not easily) which is a huge bonus. But most importantly it is a true black.